During the logging in the 1800s, the felling foreman or woods boss was called the “Bull Buck.” The woods boss told the crew to preserve the magnificent tree for posterity. The Bull Buck Tree was so named because its size made it boss of the woods. The name came from a foreman from Soquel Mill, Ed Zerlang. This was his favorite tree. Employees from Soquel knew this was his favorite tree and every time they passed this tree they would wave hello to “Big Ed.” Eventually the name stuck. This tree is on the Chimney Tree Trail. 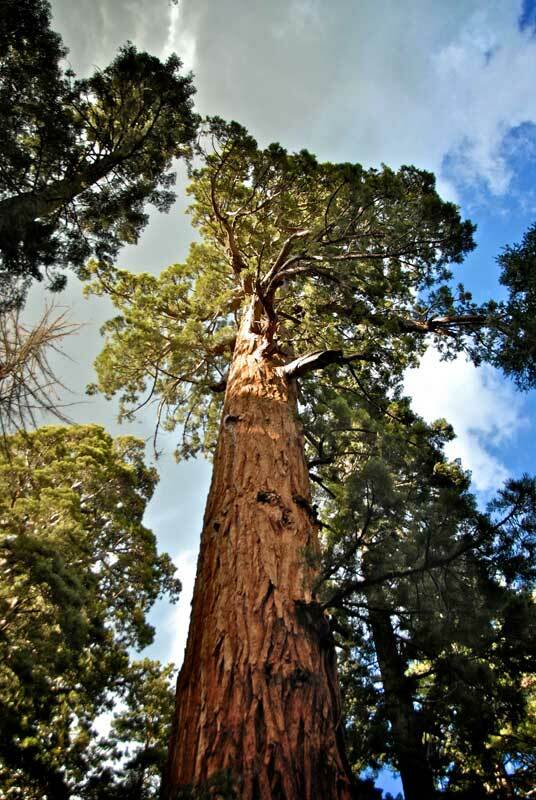 It is the tallest in the Nelder Grove campground area (at 299 ft.). This tree is named after Walter Puhn, who is a former Sierra National Forest Supervisor. This tree has a burned out center, but the outer shell of the tree is still living. This tree was named to honor John and Marge Hawksworth. They were campground hosts for 20 years at Nelder Grove. This isolated mature sequoia has one huge branch outstretched like a protective arm. Below this tree are several young sequoias.